It was a hot day last Saturday so we stopped by McDonalds for ice cream. While I was looking at the menu, I saw next to it a list of calories in most Mcdonalds meal. Wow, this is good, making people conscious of what they eat. I am not sure if they post the calory content of the food they serve in every branch. I had a sundae and a little of french fries. I an that day. Now I am checking how much calories was that!!!! This is my favorite snack for kids at home. When I have the 2 nephews here for a day and they want something to eat, I open a bag of nathan's crinkle cut fries and in a few minutes they have an instant snack. I love the crispness of the fries but soft when you bite them. I always pair it with a mixture of mayo and ketchup. Kids love it and they always ask for more. Monday to Friday from 8 in the morning until 6:00 at night, there is nobody at our house. I bring my daughter to school at around 8 am then off to work, then hubby and the baby comes home around 6pm after he picks up our daughter from the babysitter. Our schedule has been like this for how many years now but we never felt unsecured leaving our house every morning. We have a very dependable home security team that we can trust, giving us the feeling of security when we are away from home. One best home security team in the United States is ADT. They have been serving a lot of household in the U.S. for around 130 years now with 4 interconnected monitoring centers nationwide. These monitoring centers are being run by ADT trained professionals who are always ready to help you 24/7. Even during power outage, the ADT home security team is continually working through their 24 hour battery back system. Are you interested in getting a free ADT Monitored Home security system and get $100 gift card from Advanced direct? You can do so by just calling 18002626012. Just be careful for scammers out there as featured by the consumer reports where some customers are being victimized by other alarm companies. With ADT, not only do they give you security for your home but also savings and peace of mind while you are away from home. A new branch of Applebees in our town opened last monday July 19. We went to check out the place on its opening day. We are frequent customers of Applebees and our favorite is the 50% off appetizers from 10 pm up to closing everyday. Yes, no exception - all appetizers are 50%!!!!! Every dish is only around $4! We ordered the chicken quesadilla, buffalo wings, mozerrala sticks and chilli cheese nachos. I tell you, our bill was only less than $20!!!! and we had so much to take home. The chilli cheese nachos was grande...we tried to finish it first but so filling that we did not finish the rest of our orders. For sure, we will be back soon. 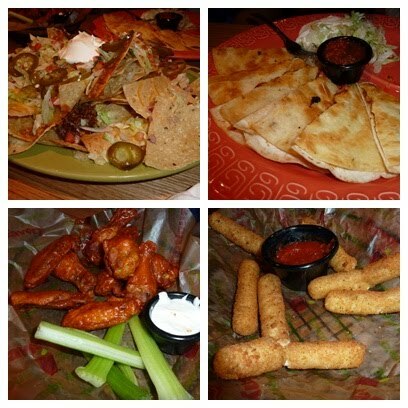 Applebees 50% appetizers in the best! How I wish we have Shakey's here. I miss their thin crust pizza ( I know there's thin crust pizzas here too but Shakey's is the best to me), mojos and chick n chips. Last time I had shakey's pizza was in 2007 when we were in the Philippines. When hubby was there last May, he took this picture for me. This Shakey's branch is at one of the new malls in Pampanga. Every day we get many offers of all kinds of insurance in our mail box or through email. There are thousands of insurance companies offering coverage to everyone, whether young or old, married or single, with kids or not. Of course, we need insurance so we have to get the one that can give us the best coverage. Guardian Insurance has a wide range of personal insurance products for Australian families. They have the life insurance, income protection insurance, funeral insurance and accident insurance. Who would say that life is not going to end? One way to prepare for it is get a life insurance for your loved ones that are left behind. This is for your peace of mind. One thing also important is the accident cover insurance. Even how careful we are sometimes, accidents still happen and to protect us from the loss of life or property incurred, an accident insurance is necessary. When there is death, funeral cover insurance is a very big help especially for the family that are left behind. Funeral expenses are very expensive. If you have funeral insurance, these expenses are taken cared of leaving no burden to your loved ones. Guardian Income Insurance is income protection insurance. When you become unable to work due to illness or injury for an extended period of time, with guardian income protection you can insure up to 75% of your monthly income before tax up to a maximum of $10,000 per month. If you want information about guardian insurance, you can request for a call, information or get a quick quote at guardianinsurance.com.au or call them at 1300709560. This is the picture of the only McDonald's branch that still serves the caramel sundae (to my knowledge ha!). I am still in the lookout for more branches. This branch is located right at the center of Atlantic city surrounded by outlet stores. It is the only fastfood in that vicinity and also one of the busiest.I have not been to this store that it's not packed by customers. Asbestos is a mineral fiber found in building materials used for construction as insulation and as a fire retardant. They are popular among builders and manufacturers because of its strength and resistant to damages brought by heat, electrical or chemical. Exposure to asbestos is hazardous to your health and one of the most common diseases you get from asbestos exposure is mesothelioma disease. Mesothelioma is a form of cancer that attacks mesothelium which covers our body’s internal organs like our lungs. There is no other known cause of mesothelioma other than asbestos. If you have been exposed to asbestos and suffering from mesothelioma disease, I recommend that you to speak to a mesothelioma lawyer if you decide to pursue a legal course of action and to discuss your case. Choosing the right person to represent you in your case is very important. The mesothelioma attorney must be an expert in his field, has the experience, skills and dedication to help you in your case. Read more information about mesothelioma disease and choosing the right lawyer at http://www.survivingmesothelioma.com. A form is available for you to be filled out at their website to receive information on recommended lawyers or law firms in your area. Not all branches of McDonalds serves Caramel Sundae anymore. They always have the strawberry and chocolate sundae but for some reason they stopped serving caramel sundae in some branches. Are they running out of caramel but they always have caramel frappe? So i don't think its because of the caramel. This is my favorite sundae so every time we are in Atlantic City, I always make sure we make a stop at their McDonalds for a caramel sundae. They always have it there. I am still in the lookout for any branch up here in North Jersey. It would be too expensive and tiring to make a 3 hour drive to AC every time i crave for a caramel sundae. This is a late post about our strawberry picking. We went to Donaldson farm in New Jersey. It's is about an hour away from our place. We got to the farm early anticipating the traffic on Memorial day weekend. The farm is huge and all you see are rows of strawberry plants. As you get to the farm market, you can buy a box for $1. You will use this box to place the strawberries you picked. There were also smaller containers for $.50. Our halfway filled box. This is the one dollar box they sold to us excluding the contents. The weather was nice and breezy; it was perfect to be outside. A closer at the strawberry plants full of ripe strawberries ready for picking. They are vine plants that crawl on the ground like bean plants. The fruits sit on a black plastic bags they placed on the ground like a blanket underneath the plants. Now it's weighing time. You pay for everything you pick but you can eat all you want while picking the strawberries. The per pound price is $2.99. It is a dollar more when you buy from the supermarket. You may say, just buy it from the store then but the experience of picking fresh strawberries is worth more than the dollar difference. This is a picture of the farmer's market where you can buy fresh fruits and vegetables picked from the farm. They also have plants and baked goods for sale. I work in a company where there are more men than women. I heard men stories all the time especially during breaks at our lunch room. Do not get me wrong, all my co-workers treat us with respect but sometimes when they all get together they cannot help share stories that sometimes women are not supposed to hear. Today at lunch break, one gentleman was sharing his experience about virtual dating. He is our IT guy, so what do you expect from a guy like him? He is online always; from his desktop, to his notebook then to his iPhone. Now, he is trying to find a partner through Smingle.com, an online dating with a twist. To be a member, there is no long forms and surveys to be filled out anymore. This is what you call virtual dating. First, you get to know your future partner by going to a virtual café or bar, play “get to know me” games like Love Match, go chat, create a fun 3D avatar that looks and dresses like you and make your 3D avatar flirt to your date’s avatar. Wow, this is a fun way of getting to know your partner without spending money. Virtual dating also helps you avoid disappointment because you take your time in knowing one another before meeting face to face. It was actually my first time to hear about virtual dating. Welcome to the world of technology and internet. Are you interested in trying it? According to a Harvard study in 2006 "Virtual dates cause individuals to develop greater affinity toward one another when they actually meet." The new cutting edge is interactive, virtual dating." This has been featured on msnbc, fox news, E, discovery channel, etc. If you are single, why do not you check it out and register at http://www.smingle.com and when you upload a picture to your profile you get 3months free!!! Good luck, you may get your perfect match through virtual dating. i am so addicted to this tamarind candies known as sampalok in Philippines. They look like raisins or even smaller and the wrapper says they are made in bangkok. it has the natural taste of our sampalok with no artificial flavor added. On the front, you cannot read the name because it is written in thailand but this is actually the moniegold in different packaging. I have bought a maniegold at the filipino store before but it was in a tiny plastic container but this new packaging is so handy. It fits even in my smallest purse.